Effective May 1, 2017, Grand Master of DeMolay International, “Dad” Bill Sardone, has appointed “Dad” Gregory M. Schaeffer to the office of Executive Officer for Pennsylvania DeMolay. “Dad” Schaeffer will be succeeding “Dad” Thomas R. Labagh, who is retiring from this office after serving as the E.O. since 2000. “Dad” Schaeffer is a Senior DeMolay of Elizabethtown Chapter, for which he served in many roles, including Master Councilor. He is a Chevalier, Legionnaire, and recipient of the Guild of the Leather Apron. 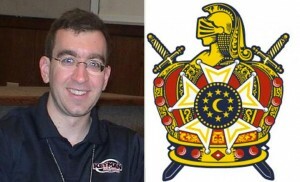 He is an Active Member of DeMolay International and is a former Director of the KeyMan Conference. He is known to PA DeMolay as a Ritual Specialist, and has served as the Department Chairman for the Ritual Department at KeyMan University since 2014. Congratulations “Dad” Schaeffer on this new appointment and we look forward to your leadership. To clear things up, “Dad” Thomas R. Labagh is retiring from Executive Officer of PA DeMolay. He will still serve as the Executive Director of the Pennsylvania Masonic Youth Foundation. In other words, “Dad” Labagh is not actually going anywhere, and will be here to support “Dad” Schaeffer through his journey as the Executive Officer.